This Creamy Tomato Soup freezes beautifully, so make a double batch! Serve the soup with crusty bread or grilled cheese. 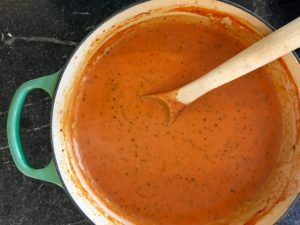 Add tomatoes, chicken stock, basil, and salt and pepper to a large pot and cook over medium high heat for 20 minutes to combine the flavors and reduce the liquid. After 20 minutes, puree the soup with a hand mixer right in the pot. Alternately, you can puree in batches in the food processor. Add the butter and cream and bring to a simmer. To thicken the soup, combine the 2 tablespoons room temperature butter and 2 tablespoons flour in a small bowl using a fork. Stir into the soup and simmer for 5 minutes, stirring until thickened. Taste for seasonings, and and salt and pepper to taste. Copyright © 2017 Our Everyday Dinners - This is an easy recipe for how to make Creamy Tomato Soup.